The Samsung Galaxy S6 is sleek and beautiful. The Galaxy S6 Edge has a really cool design that draws attention from people walking by. Plus, the front is made of Gorilla Glass from Corning. This stuff is super-durable and scratch-resistant. So why cover this all up? It’s like buying a fancy dress for a prom or wedding and wearing a coat all night. Yup. It’s necessary for safe mobile computing. Speaking from personal experience, dropping a Galaxy phone on concrete can break the glass and some of the innards. This can happen if you simply keep your phone in a pocket. There are lots of choices for cases. The most popular are made of silicone, plastic, or leather. There are different styles that meet your needs from many manufacturers. Otterbox is a brand that makes a series of cases for multiple levels of protection. 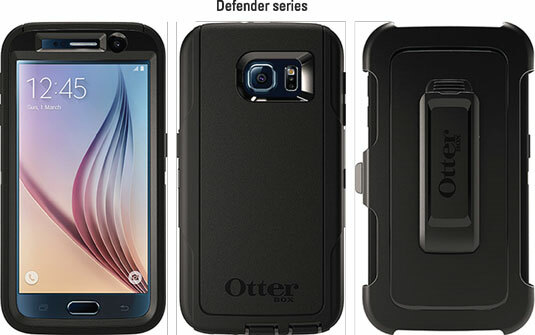 The Defender Series for the Galaxy S6, its highest level of protection, is seen in black here. You can get other colors if you prefer. Otterbox cases for the Samsung Galaxy S6. The S6 Edge offers case makers a special challenge to both display the full screen and protect the dickens out of the phone. Spigen offers an attractive and effective solution as seen here. 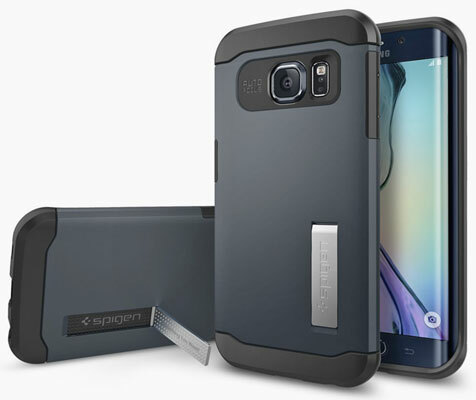 Spigen case for the Samsung Galaxy S6 Edge. You don’t just use a good case so you can hand off a clean used phone to the next lucky owner. A case makes it a little less likely that you will lose your phone. Your Galaxy S6 in its naked form is shiny glass and metal, which are slippery. Cases tend to have a higher coefficient of friction. More significantly, a case protects your phone against damage. If your phone is damaged, you have to mail it or bring it to a repair shop. The problem is that many people who bring their phones in for repair don’t wipe the personal information off their devices. You really hope that the repair shop can pop off the broken piece, pop on a new one, and send you on your way. It’s rarely that easy. Typically, you need to leave your phone in the hands of strangers for some period of time. For the duration of the repair, said strangers have access to the information on your phone. However, are you sure that you want to trust the professionalism of a stranger? Also, do you really want the hassle of getting a new phone? Probably not, so invest in a good case and screen cover. There are many options for different manufacturers of cases. Be sure to shop around to come up with the ideal combination of protection and style right for you.